I was reading over the William Carlos Williams poem, “This is Just to Say,” again this weekend after a sweet reader made my Blueberry Lemon Cheesecake Cupcakes and thoughtfully sent me a picture. Those blueberry gems were the first entry on Willow Bird Baking, and I still remember the ice cold blueberries; the cool, dense crumb; the frigid frosting . . . all that cool deliciousness is what led me to paste Williams’ poem into the entry. What was really lovely about reading the poem again is the word that jumped out at me this time around. PLUMS. Ice cold plums. Purple orbs bursting with juice, beaded with water, basking in my colander. Bulging indigo skins covering deep orange-red flesh, plucked up to the cutting board and sliced with a splush. Plush, perfect, plump plums perforated between my . . . teeth. If only there were a p-word for teeth! But you get the idea, alliterated or not. I began fantasizing about performing great culinary feats with those delicious spheres. A friend told me about an Original Plum Torte recipe she has fond childhood memories of. 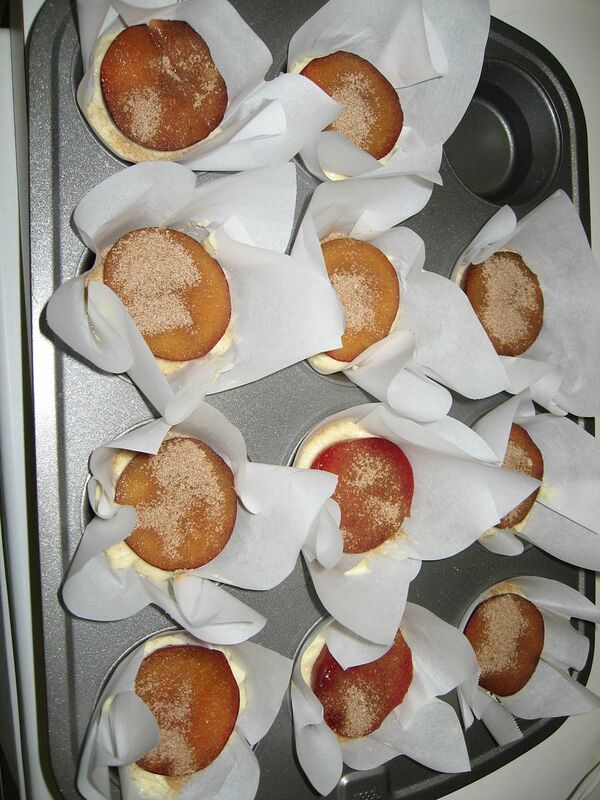 The recipe sounded delicious: cinnamon and sugar sprinkled over roasted plums inside a spongy cake. 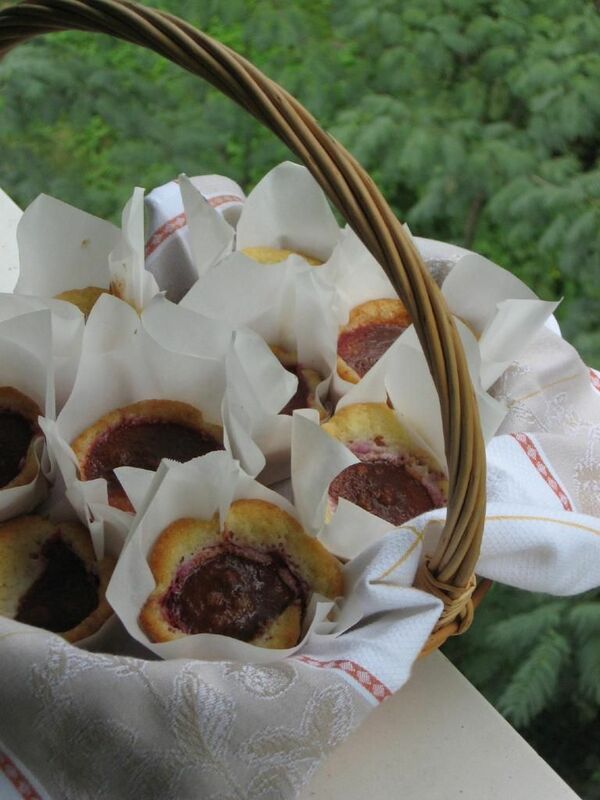 The recipe also sounded gorgeous: I love the look of naked plum halves baked until they bubble with fruity sugar. It’s a lovely presentation. I was sold. To add to the charm, I decided to turn the torte into rustic mini-tortes in parchment paper liners, topped with a dollop of Ricotta Cream Cheese Frosting and a dusting of cinnamon. I wanted to hand each person their own rich, juicy little plum, surrounded by cake and wrapped like a present in crisp paper. The Ricotta Cream Cheese Frosting is just something I whipped up today. I wanted a creamy component to slather on like clotted cream on a scone. I decided to use ricotta because I love the texture and flavor, especially with fruit, and I wanted to give the mini tortes a rustic Italian feel. I was sorry more of the ricotta flavor didn’t come through — it’s just so mild, and perhaps I shouldn’t have added vanilla — but the cheese did add a rich facet to the flavor and mellow the sugar. This ensured that the frosting had just the right amount of sweetness for this hearty dessert. I say all this like it was a given that these were going to be amazing. But really, I was nervous. I bought big plums; what if the torte didn’t rise around them enough? What if they simply fell apart when unwrapped (some were a little messy)? What if Ricotta Cream Cheese Frosting is disgusting? My lovely friend Katie can attest to my uncertainty — today at an amazing Beth Moore simulcast, we caught up after not seeing each other in over a year! While chatting about our lives (by the way, Katie bakes, so expect some joint baking endeavors! Yay! ), I mentioned these mini tortes only to immediately disclaim: they could be kitchen failures, I hadn’t tried them yet, they looked wonky, and so on and so forth. Thankfully, my fears have now been allayed. Every beautiful, splushy Plum and Cream Mini Torte I bit into (I won’t bother telling you how many I ate . . . ahem) resulted in mmmms and ahhhhs. Sometimes it’s hard to read between the lines on a food blog and decide if a given dish was really fantastic or just good. In the interest of clearing up confusion: these are fantastic, and perhaps one of my favorite desserts of all time. And since the recipe is so simple (so glad my friend shared it), you should definitely give them a try. Hope you love them! 1. Arrange a rack in the lower third of the oven. Preheat the oven to 350 degrees. 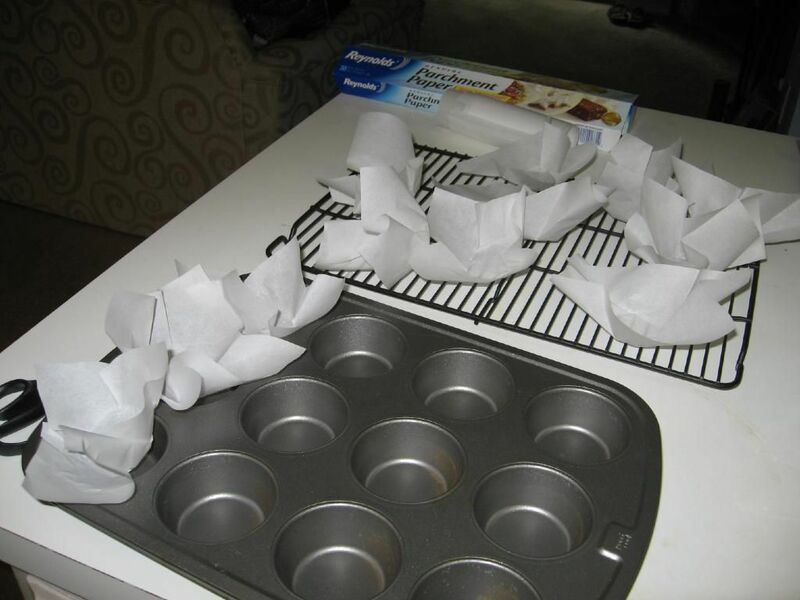 Line a cupcake pan with paper liners or parchment paper. 2. Cream the butter and the 3/4 cup of sugar. Add the flour, baking powder, eggs, and salt and beat to mix well. Spoon about a tablespoon of batter into each well. Resist the urge to overfill — the batter will rise! Gently press a plum, skin side down, into each well. Mix the cinnamon with the remaining 1 or 2 tablespoons of sugar and sprinkle over the top. 4. Make the frosting: mix all ingredients together until fluffy. 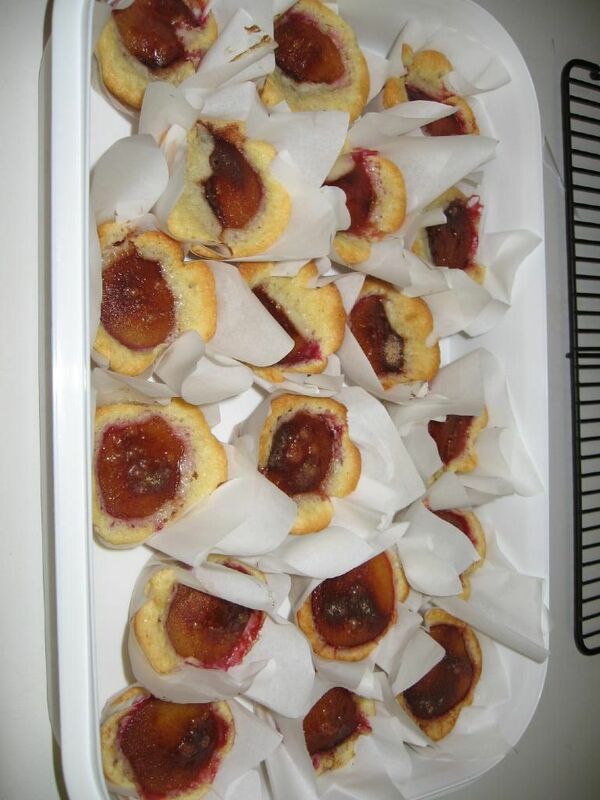 Pipe or dollop frosting onto the center of each plum mini torte. 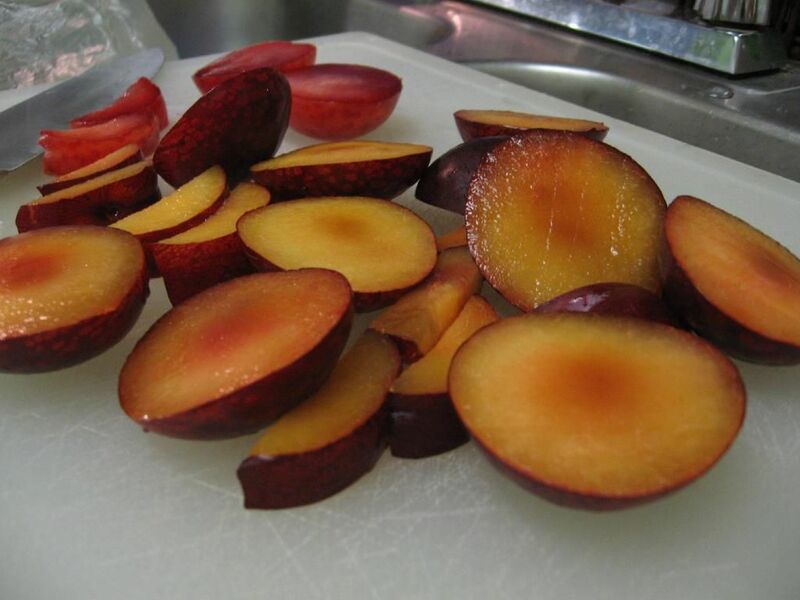 Notes: Try to buy small plums and cut them about 1/4 inch away from the center or a little more. 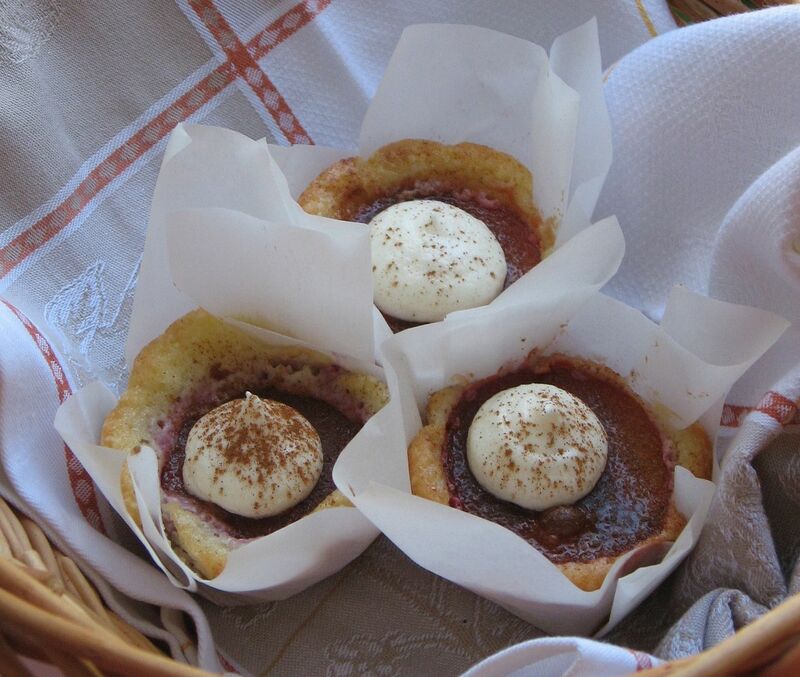 You want small rounds to fit in the center of your mini-tortes without making the cake spread too much. If the cake spreads too much, it won’t snuggle around the plum as it rises and may fall apart when you peel off the paper. 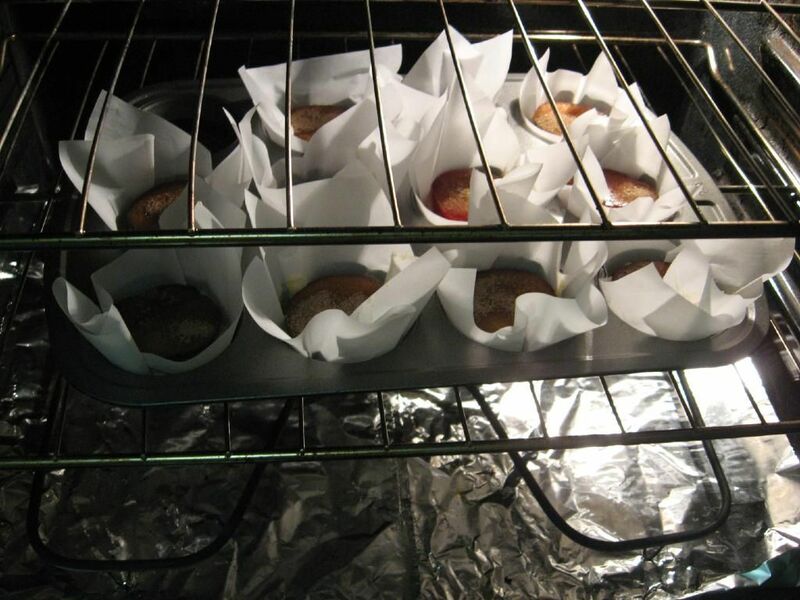 Making my parchment paper liners and readying my mini tortes for the oven. Baking and fresh out of the oven. Thank you, Lorraine! I decided tonight that these were one of my favorite desserts so far. Mmm! What an awesome way to use some plums. I have many sitting in my fridge and they are just a bit too sour to eat. This recipe will be perfect for them. Oh, by the way, your doggie Byrd is completely adorable! I have a great love for dogs. Well, animals in general. Love them all. Thanks for you comments on my friend’s husband’s death. Wasn’t that just a crazy freak accident? We had a wonderful time going out to dinner & drinks last night. We ate down at Pike Place Market at Etta’s Seafood. Beautiful place. She is doing well. She’s a naturally happy & giggly person. There will be a trial soon and she was the only witness to the murder so she has to relive it all. The killer is out on bail right now! Ugh! That’s makes me angry. Anyway, thank you for the comments. Have a good evening! I will be posting another dessert soon. It’s in the oven as I’m typing this. Thanks Heidi! Hope you get a chance to try these — they were SO good! And thanks from Byrd, too 🙂 I’m a little nuts about her. Such a dog person as well! YES, I couldn’t believe that about your friend. I told Mike (my boyfriend) about it earlier. I’m glad to hear she’s doing well for what’s been going on. Prayed for her today. I hate that she has to go over it again in trial. Looking for your new blog post soon! YAY go Mom! I thought of bringing some over but remembered about the LC diet. I will still bring Alex some stuff sometimes (and Dad too if he wants it). what an awesome way to use plums! Thank you, Felicia! I thought it was fun (and totally unintentional) that some of them looked like flowers! 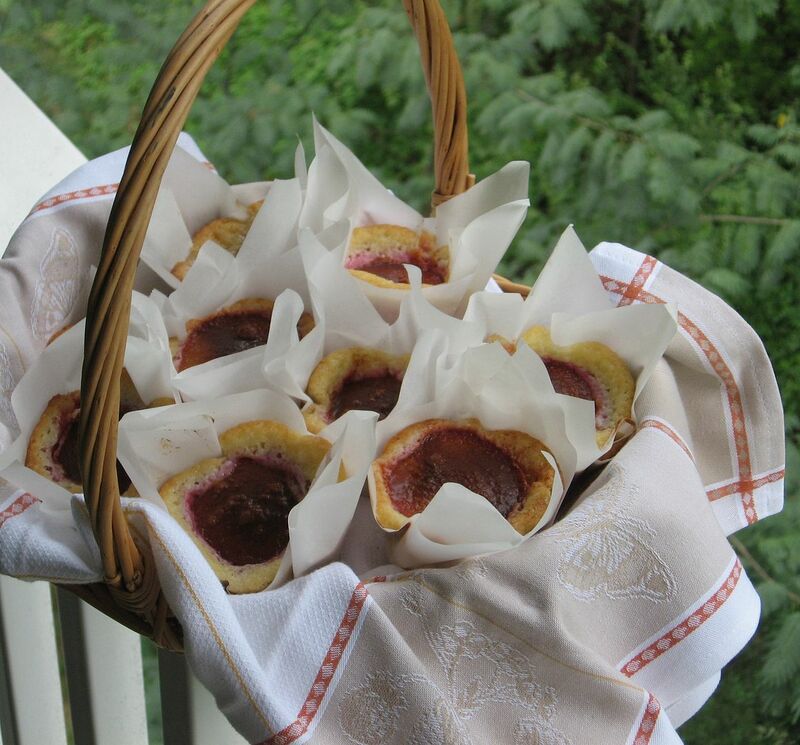 Oh, I just love your little plum tarts. You did them up so pretty in that little basket! what a treat! Thank you, Ash! Love your blog! These tortes look really pretty all wrapped up in their lil packages 🙂 I’m sure they tasted fantastic! Thank you! I’m wishing we still had some — they were so yummy! Just wanted to pop in and say I gave these a try after you posted the recipe on LJ. Yum! They were perfect with the pile of Italian prune plums I bought at our local farmers market. I put mine in cupcake liners, cooled them to room temp, put a healthy dollop of frosting on each one, set them in the fridge for 15 minutes to make sure the icing was not too soft, and they traveled to a friends house snuggled in a towel in a tin. I used the same amount of vanilla in the icing but cut back the sugar by 1/2 cup (and may go as far as cutting back a whole cup). I love the texture with the ricotta! I’m plotting a more fall oriented version, maybe with homemade chunky applesauce spooned into the middle and a spiced frosting on top. Hi Amy! So glad you enjoyed these — we were wild about them! Thanks for your frosting notes, too. I liked this version, but I do want to do a little fiddling and see if I can’t bring out more of the ricotta taste. Let me know how your apple versions turn out! I thought of how lovely these would taste with peaches, too. Mmm. You know what’s funny, Amy? Right after I posted this comment, I went onto a cooking community and saw someone who had just made them with PEACHES! I’m going to see if I can post her picture. They look yummy! By the way, if you snapped a photo, I’d love to post it as well. No pics unfortunately, my camera was not cooperating. The apple ones turned out well, though this time my frosting never whipped up. I think it’s because I used a low(er) at ricotta. Oh no! I’ll just have to make them again! I’m also thinking a sweet potato or pumpkin puree one might be next on the list (I have a fall tea party to attend in a few weeks). I believe I’ll try these torts when peaches are in season, perhaps with plums also, but not the frosting. The hubs and I don’t like ricotta in any recipe. The Atkins diet cured us of ever trying it again, lol! I’m think of a little whipped cream with almond extract instead of vanilla would be yummy, or home made vanilla ice cream. I splurged a little this year and bought an ice cream maker. Heavenly, but I’d also just enjoy some heavy cream poured on top; sure wish I could find some that isn’t ultra-pasteurized, so it would have some actual flavor. Any of those options would be lovely! Almond whipped cream especially, or even a nice cinnamon whipped cream. Yum! So I am absolutely obsessed with this recipe! Unfortunately, I stumbled upon it in winter, not plum season! Do you think this recipe would work with pears? Your blog is one of my favorites to read, even when I’m not in a baking mood! Thank you, Lauren! I think you should try it for sure!!! Let me know how it goes!